A young man who immigrated to the United States when he was 12 is graduating from a Dallas high school at the top of his class. Jorge Rodriguez Santana didn’t know a word of English when he was forced to start a new life after his mother moved he and his sister from their home in Mexico. “I didn’t know any English," Sandana said. "I didn't know how to communicate. It was really difficult to begin a new life in the United States." He’s able to continue his studies as an undocumented student through the Federal Deferred Action for Childhood Arrivals program. The program allows temporary visas to undocumented students who arrived in the United States as children. 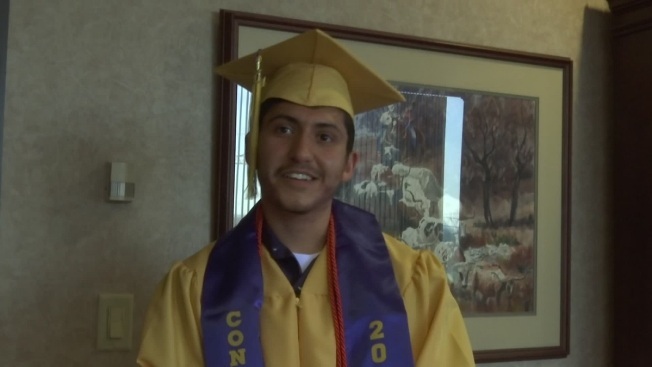 Santana graduates from Emmett J. Conrad High School as valedictorian — his dream. His good grades and determination also earned him a $11,500 scholarship from Carter Financial Management. Santana will be the first in his family to attend Texas A&M University next year and plans to become an architect.